Inspirational Quote 1 cross stitch pattern... 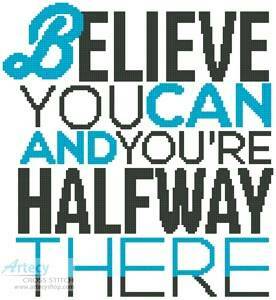 This counted cross stitch pattern is of an inspirational quote, Believe you can and you're halfway there. Original design by Sergo. Only full cross stitches are used in this pattern. It is a black and white symbol pattern.